The principles of hot water extraction are not in dispute and many carpet cleaners use them. However some home owners try to take shortcuts and that creates even more work for them. The purpose of this article is to illustrate to possible to use hot water extraction carpet cleaning methods without getting involved in technical processes. A technical person may be called to help you with drying and dehumidifying flooded areas but there is plenty that you can do on your own. Flood damage restoration is at the top end of the maintenance tasks that are required in the home and therefore should not be used as an excuse for you not to get involved. Clean all the areas that are affected before making use of the extractor. The detergent can help get rid of soil but it also needs assistance on your part. Do not ignore the pre-cleaning process which removes some of the excess debris that could conceivably be a problem. 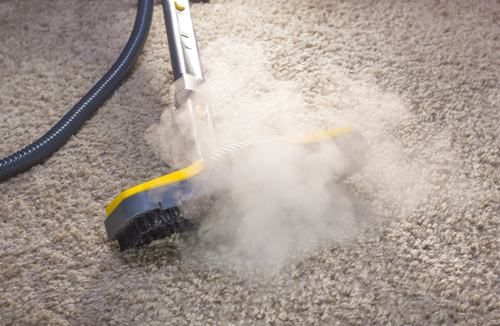 Areas of the carpet that are soiled heavily will require a pre-spotter. This is particularly important for traffic lanes. If the pre-spray has not caught on properly then the process can be repeated in order to ensure that it works. There is a recommended time lag that is required before you start cleaning the carpets. This is designed to give the chemicals an opportunity to begin working. If you fail to wait for this time lag then you will not get great results. Each wet pass should be accompanied by 2 vacuum passes in order to balance them out. This is designed to reduce the amount of moisture that you are working with. Going for longer than the recommended times means that you reduce the efficiency of the carpet cleaning solution. Although the equipment can play an important role in making the work easier, if it is not properly used the results tend to go the other way. It is always recommended that the drying process should be as quick as is practically possible. Some professional carpet cleaners use drying fans which make things much faster than they would otherwise have been. You should aim to reduce the standard drying time by up to 40% using fans. They are known to be very hardy and durable but the cleaning process for them is not straightforward. In particular you will need to watch out for the moisture which can lead to shrinkage later on. Likewise the wrong use of the cleaning chemicals can turn the wool carpet brown. Nevertheless there is a de-browning process which you can use just in case that happens. The thing to really watch out for in wool carpets and rugs is the fact that they tend to hide the dirt very well. That means that you may not even know that the fabric underneath has already been destroyed. Residential carpet cleaning is also very useful for combating allergies and so you could be achieving many objectives at once. As professional carpet cleaners we have numerous specialist treatments we can use to treat difficult coffee stains and other stains. If you live in our service area then please give us a call if you need any help.